I heard about the new Windows 7 and got an evaluation copy online. I thought it was cool and better than Vista, but kinda competing with XP in terms of Program compatibility, thus the need for a windows XP mode which comes with it. Sorry, the Windows 7 RC is no longer available for download. I'm Lucky i grabbed the evaluation copy from Microsoft which will expire on June 1, 2010. its about 2GB so i cant share, but i bet it will be on torrents and other file sharing sites by now. If not you all will just have to wait till the final release is out, not long as it's nearly ready. Windows 7 is on its way to manufacturers, and will be Officially available on October 22. "[The encryption feature] BitLocker was a key enhancement in Vista, but Windows 7 takes that a step further," BitLocker To Go is the new feature. If you take a traditional USB drive and then turn on BitLocker, you can either put in a password or lock [the USB drive] using a smartcard." A USB drive encrypted using BitLocker To Go will be usable on a PC running Windows 7, Vista or XP — although an XP machine will only be able to read the drive after downloading software to allow this. "Any hardware that runs Vista, you can have confidence it will run Windows 7 the same or better without a hardware upgrade,". The new OS is "fundamentally built on Vista", most Vista-compatible applications will also be compatible with Windows 7. The exceptions would be applications that are highly operating-system-specific, such as antivirus or file-management software. "designed and optimised for the mobile PC, whether it is a netbook or a laptop", and claimed the new OS would work even on current netbooks such as those using a1.6GHz Intel Atom CPU. A key feature for business users, would be Direct Access. This feature, also included in Windows Server 2008 R2, lets mobile workers access their corporate networks without the need for a VPN. It also lets IT professionals remotely manage laptops, even if the machines are too small to allow for the incorporation of a smartcard reader. 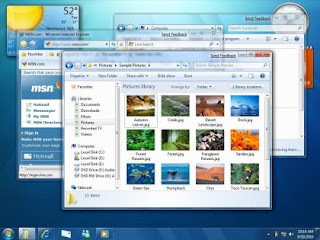 Power-management enhancements were also made in the Windows 7 operating system. So we'll just have to wait for the official release. To all those who had the chance to get the Beta Test do comment. I still have my copy so hola if you need it..